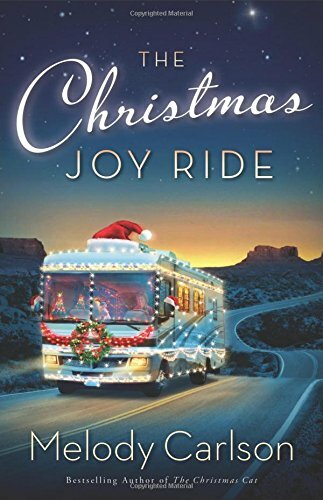 The Christmas Joy Ride by Melody Carlson is a totally delightful Christmas offering. Nobody does Christmas quite like Melody Carlson. Every year a new tale comes out and every year I just have to buy it. Eighty five year old Joy is moving two thousand miles to be closer to her sons. They think she is flying down but Joy has other plans. She has dusted off her old RV, decorated it with Christmas bling and is ready to go. Her neighbour Miranda is worried about Joy travelling so far on her own. She shares her worries and finds herself conscripted into joining Joy! On their journey Joy has six stop offs to make. As Christmas Joy, she wrote a blog and set a competition asking for people to write in about those who deserved a special treat at Christmas. Joy chose her winners. Now the magic begins. Christmas is the obvious theme running throughout. For many Christmas is a happy time but there are those who are too poor or too hurt or too old to celebrate. Here is where Christmas Joy steps in to spread some Christmas cheer. May we too notice those in need this Christmas. There is the theme of friendship in The Christmas Joy Ride. Joy and Miranda in spite of their vastly different ages are neighbours and friends. They look out for each other. They care for each other. They love each other. The two friends are also united by the fact that they are both forcibly single – Joy’s husband died several years ago, and Miranda’s husband ran off. No one should be alone at this time of year. There are several ‘hurting’ characters within the novel who definitely ‘guard their hearts’. This does not make them happy but they have shut life and Christmas out because they fear being hurt again. In order to fully live, they must re-open their lives and their hearts to those around them. Oh how I really loved The Christmas Joy Ride. Melody Carlson writes the most magical Christmas books that leave you with a warm fuzzy feeling and a heart full of joy, and a restored faith in humanity. A totally perfect read for Christmas.